Creating product labels can be a daunting task. In this article, we outline some important factors to consider when designing your own labels. For more information on labeling content, visit our Labeling Info page. A clean label with eye-catching colors and easy-to-read text is a good starting point for most product packaging. You want customers to choose your product over the competitors' at a glance. How your product be stored and used. Ex. resistance to water, chemicals, heat, etc. Choose label colors that complement your packaging. 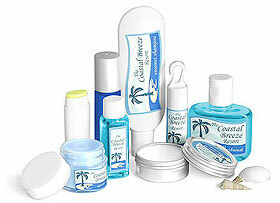 Make sure to use your digital proof to visualize how your label and container will look together. 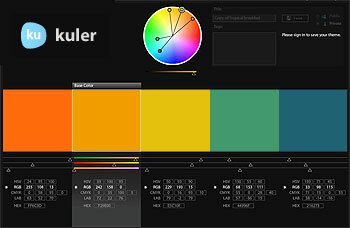 Applications such as Adobe Kuler can help you choose appealing color ways. Color themes can be downloaded for use in a variety of Adobe applications such as Photoshop and Illustrator. Pantone is a popular system based on standardized colors, the goal of which is to produce accurate color matches. 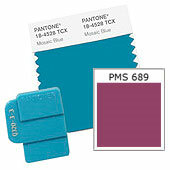 Pantone serves a variety of markets from graphic arts and fashion to packaging and industrial design. Pantone Plastics color system consists of polystyrene color chips in three-step thicknesses so you can see how a Pantone color will look in different plastic weights. Having a prominent logo or graphic can help draw your customers' attention to your product. Stock photos and illustrations are inexpensive and most can be used without purchasing extended licenses. Be sure to check the license agreement before using others' artwork to avoid legal complications. iStockphoto is a good resource for royalty-free photos and illustrations. Choose a font that complements your packaging theme. Some studies suggest that serif fonts (Times, Book Antiqua) have better readability in print than sans-serif text (Arial, Helvetica, Geneva), but this has not been proven absolutely. The consumer needs to read the most important parts of your label from a reasonable distance and at a glance. Make sure that your brand name, company and a few words describing the product are large enough to read from about six feet away. Fonts.com is a helpful website with information about font usage, where to download unusual fonts and how to select a font for your needs. In order for your brand to be easily recognizable, it is important to maintain the major design elements of your label throughout your product line. Even if a consumer is looking at different flavors of products within your line, he or she should be able to instantly recognize that they are all part of the same brand. Products such as food and cosmetics often require government regulated labeling. This may include nutrition information, ingredient lists, common allergens, net weight and size. View our Labeling Info page for a summary of common label guidelines. You may also want to add contact information such as a website, physical address and phone number to make it easy for customers to learn more about your company and products. Unless otherwise specified, we will choose the best wind direction for your labels based on the dies and materials used. If you're applying your labels by hand, wind direction is not crucial. Sometimes it may be necessary to specify the unwind direction, particularly when using a label dispensing machine. For more information about label unwind direction, visit our label specifications page . Once you have submitted your finalized artwork to to us, we will supply you with a digital PDF proof.